I am an engineer not an UI/UX designer. I dabble in those things and sometimes have an idea of what is good and bad from past experience but it is certainly not my strength. You can see that in the evolution of Monal over the past decade. We are always presented with a need to balance user friendliness with lots of options. I have rarely seen anything get the balance right. Oddly artwork has always been one of the hardest things to deal with. Icons are super important. I started off using icons from KDE and later bought Glyphish, which I have been using since iOS 5 or so. I recently discovered Icon Deposit, where a lot of things I would have killed for in the past are available for free with attribution. It is the open source model applied to artwork. This is something I would recommend other developers checkout. Are there other resources like this? I haven’t paid attention to it in ages. OMEMO key viewer is in. Trust/untrust toggle doesn’t work yet and you can’t view your keys yet. Those are all coming. 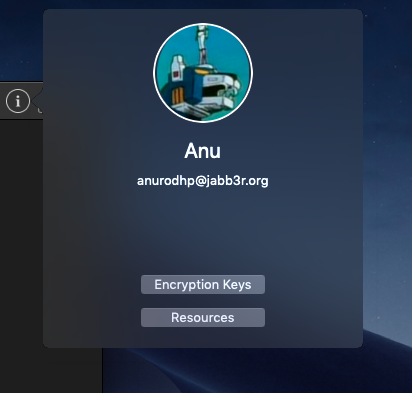 A quick glimpse at the key management screens and the new details screen on macOS. These will be in the next beta. A quick fix for decryption issues. If you have used earlier betas, after upgrading, remove your account on every device with monal (iOS and Mac) and re-add it. There was a bug in earlier betas that messed up the signal session and a clean slate should help a lot. There are new betas for Mac and iOS. 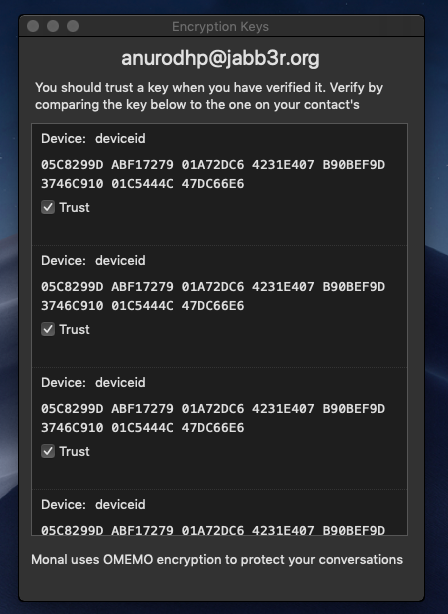 This should resolve crashes on the iPad as well as any decryption issues seen on both platforms. There are new betas of the Mac and iOS clients up. I have tried to address issues with synching between your own devices. If you see and error instead of the message on synching, send a few messages back and forth. If it doesnt work for you, I recommend readding your account in Monal. This will create a new device in OMEMO, so you will need everything you contact to trust the new device. This should generally happen automatically with most apps. A first take at this screen. I’ve tried to keep it as simple as possible. Establishing the circle of trust is important in cryptography and is one thing OMEMO does not actually address. While you should verify identities, how does someone do it? A simple way it to look at the strings side by side. Ideally this is something that can be done with a QR code to eliminate the manual process.